Smoody is another line drawing puzzle game for the iPhone and iPod touch, one of the best formats for casual games on touch based devices. The story in Smoody is about reuniting Smoodies that are scattered throughout the universe, but the story really doesn’t add any value either to the levels or continuity between them. It goes without saying then that the controls are very simple yet surprisingly precise, so it is easy to get into this game right away. 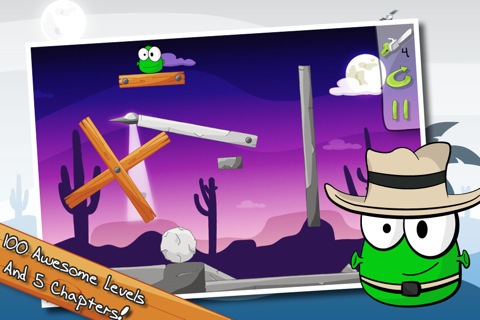 There are 5 chapters and 100 levels, and if you pop into the in App Store you can also purchase more Smoody characters. 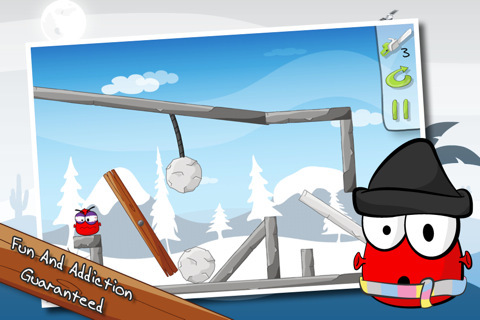 This game is a lot like Cut the Rope, only better. With great features like ropes, magnets and teleporters to intact with there is much to think about and the gameplay is truly addicting – I almost finished the whole game in one sitting. The graphics really are perfect on the retina display, there was no slowing and the colors are bright and the detail in everything is crisp and clear. I really dislike the in game music, it is lively enough, it’s just annoyingly repetitive, the other sounds are great though. I was also a little annoyed by the noise and hastening that the Smoody makes when you are taking too long, but I soon realized that it was adding just the right amount of pressure to combine with the other features and keep me riveted to the edge of my seat. This game is a whole lot of fun, and when I was recommending it to my friends I discovered that there is a lite version and a guide in the App Store, the same are available for the iPad which is great, but I was disappointed to see that it was not universal. In the few hours I sat playing the game it did crash on me 4 times which is not good, but hopefully an update will fix that soon. Take that away, and this is the second best game I have come across this week and is well worth the $0.99 that it is going for at the moment. It currently has a 4 star rating in the App Store and I am really torn between the 5 stars I would like to give it, and the crashing issue. AppSafari review of Smoody was written by Richard Best on July 29th, 2011 and categorized under App Store, Arcade, Fun, Games, Line Drawing, Puzzler. Page viewed 3762 times, 1 so far today. Need help on using these apps? Please read the Help Page.